Did these photos the other day for a new webstore called Clothes & People! When the two owners told me to go to Rider's Cafe I expected it to be just a horse-themed cafe so I was pleasantly surprised to realise we would be taking photos with an actual horse! 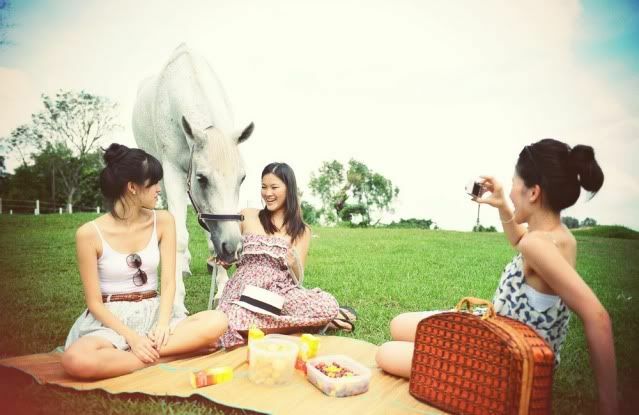 Haha the owners even prepared real picnic food for us to eat while taking the photos! The horse kept coming over to try and get some snacks for itself; so cute! HAHA this photo looks so funny. Amber's face is like :D + :O and I'm like *pout*- "what's this?" (mental dialogue). My eyes were hurting like crazy for these looking-at-the-sky shots ): Anyway the reason why sunglasses/frames keep getting featured in the photos is because Clothes & People sells authentic sunglasses too. That's me doing a fake OMG-look-over-there pose. Haha I kept saying what were the realistic odds of 3 friends all wearing maxi dresses to work together, but whatever. GAH I look insanely longggggg here because of the angle. So... like I said in my Twitter (a brain-cracking URL of twitter.com/sophiewillocq), I'm extremely good at doing nothing. 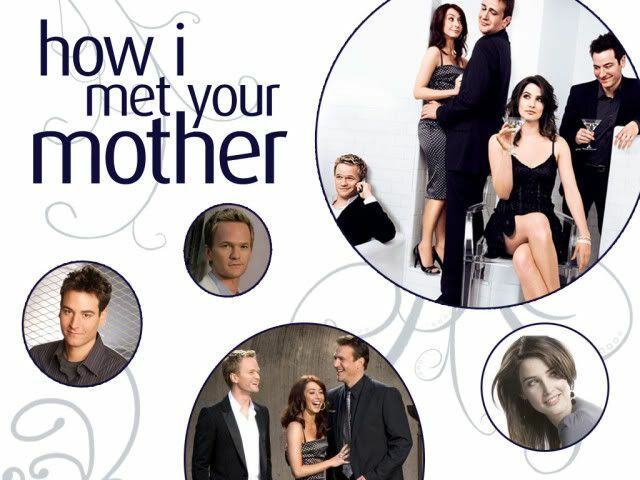 The other day I read quotes (Wikiquotes) from every single episode of all 5 seasons of How I Met Your Mother (HIMYM). Anyway some of you might have noticed on Facebook that you have friends calling themselves something Stinson. Like for example I have two friends who changed their Facebook names to Alvin Stinson and Derrick Stinson -_- (despite me saying that this will never make them like the HIMYM character, Barney Stinson). Barney Stinson is the blonde guy with the high forehead, who in real life is comedian Neil Patrick Harris, and is supposedly (or openly) gay. This is a huge contrast to his character Barney, who comes up with all kinds of ploys and tricks to get girls. Seriously. Jesus started the whole Wait Three Days thing. He waited THREE days to come back to life. It was perfect! If he had only waited ONE day, a lot of people wouldn't have even heard that he died. They'd be all, "Hey Jesus, what up?" and Jesus would probably be like, "What up? I DIED yesterday!" and then they'd be all, "Uhh, you look pretty alive to me, dude..." and then Jesus would have to explain how he was resurrected, and how it was a miracle, and then the dude would be like "Uh okayy, whatever you say, bro..."
And he's not gonna come back on a SATURDAY. Everybody's busy, doing chores, workin' the loom, trimmin' the beard, NO. He waited the exact right number of days, THREE. Plus it's SUNDAY, so everyone's in church already, they're all in there "Oh no, Jesus is DEAD", then BAM! He bursts through the back door, runs up the aisle, everyone's totally psyched, and FYI, that's when he invented the high five. Three days. We wait three days to call a woman, because that's how long Jesus wants us to wait.... True story. Everyone needs to watch the show itself to really see the humour! Alright, I've so many plans for blogposts for this old, old space (I've been blogging since early 2005 to be exact, but only moved here end 2005) but like I said, I'm good at doing nothing. And surprisingly (or not), that helps time pass incredibly quickly. But I think I'll be able to sell off some of my clothes soon! 7 comments on "Photos with Horses"
having angmoh blood running thru ur veins makes a big difference..
haha i even downloaded the whole Bro Code! really pretty pictures. may i know whats the price range for food at the cafe? and anyone is allowed to just take photos with the horse? y didn't u transform that horse into an unicorn? Sylvia: Haha is it very long? Xinyi:Hi dear! We didn't eat/enter the cafe at all, just took pictures around the area outside. You're allowed to wander around and take pictures. As for the horse, they had a prior agreement with the owner. This angmoh woman owns two horses that she keeps at the stables there and she agreed to let them be used for the photos and was there to help ensure they behave etc. So for the horse part I'm not sure how you can get some, but you could ask staff at the Rider's Cafe/stables if they know of anyone that might be interested?